With this release, Comb & Razor Sound launches its exploration of the colorful world of popular music from Nigeria, starting with the post-disco era of the late 1970s and early 80s. The years between 1979 and 1983 were Nigeria's Second Republic, when democracy finally returned after twenty-three years of uninterrupted military dictatorship. They were also the crest of Nigeria's oil boom, when surging oil prices made the petroleum-producing country a land of plenty, prosperity and profligacy. The influx of petrodollars meant an expansion in industry and the music industry in particular. Record companies upgraded their technology and cranked out a staggering volume of output to an audience hungry for music to celebrate the country's prospective rise as global power of the future. While it was a boom time for a wide variety of popular music styles, the predominant commercial sound was a post-afrobeat, slickly modern dance groove that retrofitted the relentless four-on-the-floor bass beat of disco to a more laidback, upbeat-and-downbeat soul shuffle, mixing in jazz-funk, synthesizer pop and afro feeling. 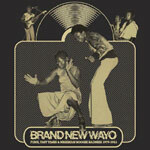 At the time, it was still mostly locally referred to as ''disco,'' but has since been recognized as its own unique genre retrospectively dubbed ''Nigerian boogie.'' A Brand New Wayo: Funk, Fast Times and Nigerian Boogie Badness collects 15 pulsing Nigerian boogie tracks in a lovingly compiled package chronicling one of the most progressive and creative eras in the history of African popular music.